A panoramic shot of Kaneohe Bay, on the east coast of Oahu. Can you see the P-3? Today’s adventure was a trip over to Kaneohe Bay on the east side of the island, a location well-known for snorkeling. We were not disappointed. 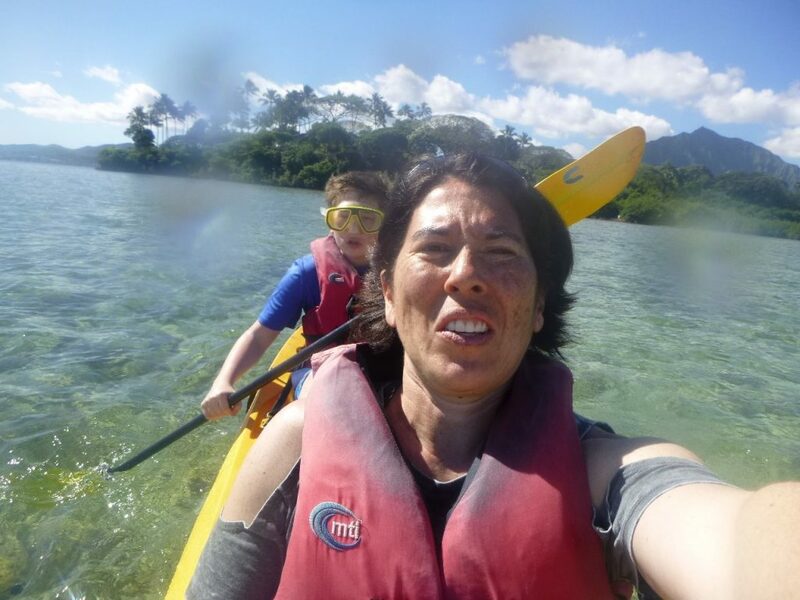 We booked a 1/2 day self-guided kayaking and snorkeling package through Holokai Kayak & Snorkel Adventures, which is a non-profit that operates out of He’eia State Park along the bay. The package we reserved included transportation to and from our hotel, two kayaks, snorkeling equipment, plus lunch after ~3 hours on the water. Everyone there was very helpful and friendly, and I’m very glad we elected to do the “self-guided” instead of the “fully guided” version. Heck, we have two sons with canoeing merit badges, it was quite easy. The Holokai folks gave us a map (which we ended up losing at the first snorkel site, oops), and briefed us on the good and not-so-good locations to see the fish and our best chances for turtles. 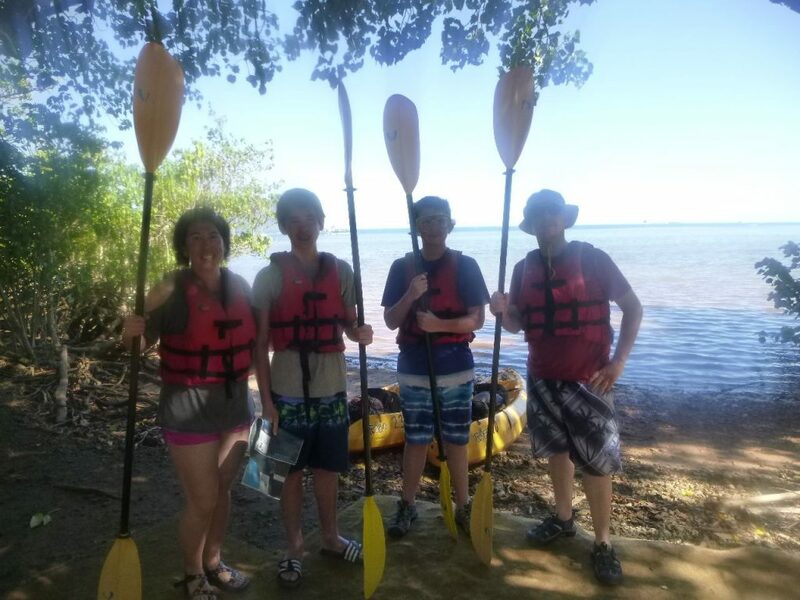 Our family of four (Dad, Mom, two teen sons) booked the “Self-Guided Kayak and Snorkel Discovery” online: For ~$85 per person we could spend 3 hours on the water exploring and snorkeling in Kaneohe Bay, receive transportation to/from our Waikiki hotel, and enjoy a homemade Hawaiian BBQ lunch. We were very pleased with the experience and recommend it as a great way to enjoy some of the world’s best snorkeling. The van picked us up within the timeline they said they would (between 8am – 8:20am), and we were at the facility at He’eia State Park around 9am. They had lockers available to stow any gear we didn’t want to take in the kayaks, and then they walked us down to the shoreline to get fitted for snorkel equipment. My youngest son, who wears glasses, was able to use a dive mask with corrective lenses. We received a briefing of restricted areas on the bay, as well as the best reefs to see fish and turtles. Then we headed out. The weather was fantastic, the bay was relatively gentle, so we had no problems paddling out to our first reef location: we put on our gear and checked things out. We spent about 20 minutes at the first location, then paddled to a second location, where I was able to see a turtle, but it was booking somewhere in a hurry, so it was a short-lived viewing. After about 10 minutes at the second reef, we paddled back and turned in our gear. We were out for about 2 1/2 hours and our kids were thoroughly exhausted after that. The homemade BBQ lunch was delicious and a welcome break from the restaurant food we had been eating the past 2 days: grilled ribs, chicken, and corn; fresh-made white rice, salad, and fresh local pineapple. It was all so delicious. After lunch the van took us back to our hotel. We were back at our hotel by about 2:30pm. The family ready to head out for a morning of snorkeling! Timmy was able to use a “corrective lens” dive mask. He insisted he could canoe around with them but he ended up ditching them after just a few minutes. Dave and Jacob were decidedly faster than Timmy and me. 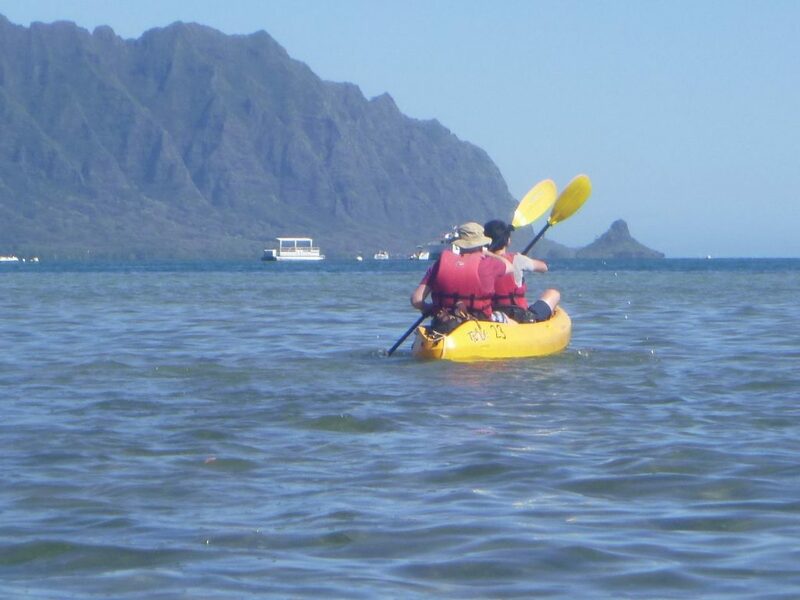 You can see the famous “Chinaman’s Hat” island just to the right of the paddles. The kids did a great job, but we were all pretty beat by the time we got to the snorkeling areas after paddling about a mile. We snorkeled in two different areas for a grand total of about 30 minutes, then headed back where the Holokai folks prepared us a delicious homemade BBQ lunch. Correction: We all snorkeled in one area, then I snorkeled alone in a second spot while the boys hung out in their kayaks. I got to see a huge sea turtle, but he was booking somewhere in a hurry so I didn’t get to take a picture. 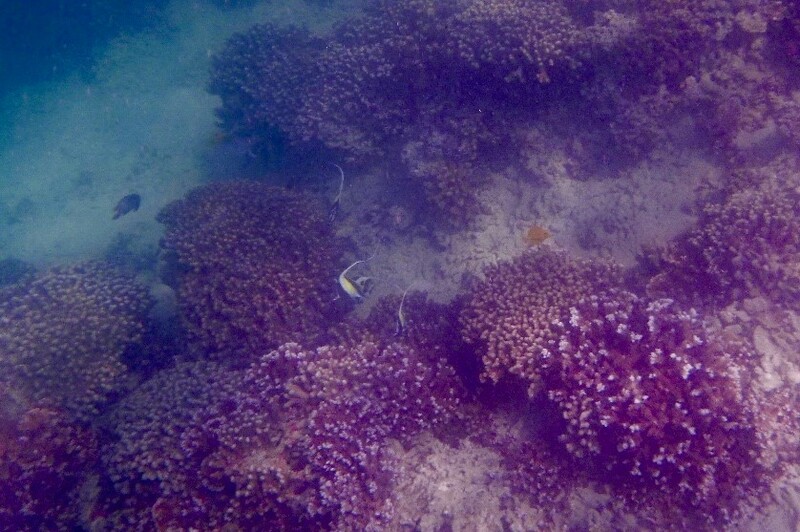 Our family has an underwater camera, but it was tough to point and shoot in the general direction of what I wanted to capture, so I’m not especially happy with the shots. I picked one of my underwater favorites to share here. We got back to the hotel at about 2:30pm, thoroughly exhausted. We ended up staying in most of the rest of the afternoon; I took a brief walk by myself along the beach before dinner, visiting some of the classic hotels such as the Moana Surfrider and Royal Hawaiian. The Moana Surfrider, Waikiki’s first hotel, built in 1901, has been very nicely restored to its turn of the 20th century styles. Not my photo, but this is an accurate look at the lobby of the Moana Surfrider. It’s been restored to a Titanic-era design, gently blended with tropical accents.